A diet to lower cholesterol is important in helping reduce the risk of heart disease, a condition which affects close to 61 million Americans. 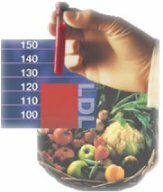 It is important to keep levels of LDL down, but most people don't know that it's just as important to keep good (HDL) levels up. Despite all the negative press, it is an important part of proper bodily function. Cholesterol is a non-soluble waxy substance which your body needs to make hormones, cell walls and nerve sheaths. There are two types of cholesterol, one is bad, one is good. Following is a brief description of each. 1) Bad Cholesterol (LDL) - LDL attaches itself to artery walls, creating plaque that can build up and eventually block your arteries, which could result in a heart attack or stroke. 2) Good Cholesterol (HDL) - HDL travels around in your bloodstream, picks up excess LDL cholesterol and brings it back to your liver to be reprocessed. Therefore, HDL is cleaning out your body. Most people think that their levels are directly related to the cholesterol that they take in. So a diet to lower cholesterol will mean that you will have low cholesterol levels in your blood...right? Wrong! Over 75% of your body's cholesterol is produced by your liver. Diet is only a small factor in influencing your body's total cholesterol level. Nevertheless, you should certainly watch what you eat to help keep your LDL down. Diet to Lower Cholesterol - What should you eat? Limit your intake of trans fats, found commonly in margarine, even the so-called "healthy" varieties. Reduce your intake of hydrogenated oils and unsaturated fat, found commonly in refined and processed foods. The saturated fat in eggs and butter is actually essential for the body, so no need to avoid them. A low fat, low cholesterol diet can be dangerous because it can lower HDL (good) cholesterol, and have minimal impact on LDL levels. So a low fat diet can actually make matters worse. Take Omega 3 essential fatty acids, found commonly in organic flax oil and cod liver oil. Omega 3's are necessary for proper function of your heart. Use Extra Virgin Olive Oil when you cook if possible, as it has been shown to help lower LDL cholesterol and raise HDL cholesterol. Add garlic to your cooking and dishes. It has been shown to lower LDL cholesterol as well. As we mentioned above, though, only 25% of your body's cholesterol comes from your diet. So along with following a healthy diet to lower cholesterol, it is also necessary to maintain cholesterol levels within the body itself. There are natural herbs, vitamins and minerals that can help lower LDL cholesterol and raise HDL cholesterol in the body. They have been shown to be safer than prescription medications, which can have many side effects. These nutrients can be helpful along with a diet to lower cholesterol. Following is a list of these therapeutic nutrients. Olive Leaf - native to the Mediterranean region, studies have shown that olive leaf extract may lower cholesterol levels, as well as facilliate blood flow and lower blood pressure. Ginger - according to a study in the New England Journal of medicine, ginger helps reduce cholesterol in the body. This powerful herb used often in Chinese cooking also helps lower blood pressure and thins the blood. Make sure you adhere to recommended dosages of these nutrients and reduce your dosage if you experience any unpleasant side effects. If you are pregnant or nursing, you should avoid herbs and herbal supplements. As with any health supplement, consult a physician or qualified health practitioner before you take supplements to lower cholesterol. If you are interested in taking a supplement to help lower cholesterol, you should look for one that has a synergistic balance of the above herbs and nutrients, along with other essential vitamins and minerals necessary for promoting general health and well-being. A) You can help several body systems at one time - you can treat the problem with one nutrient, protect your body with another and make sure the problem does not return with yet another nutrient. B) Many herbs work together synergistically - often a blend of herbs, vitamins and minerals can work better together than one nutrient on its own. The therapeutic effect is enhanced by the nutrients working together. C) Nutrients can offset the possible side effects of each other - an herb that helps alleviate a problem in one area can help treat a slight side effect that may be caused by another. Did you know the contents of natural health products are not regulated? Not only that, there can be discrepancies from one brand to another, and even from one batch to another of the same brand! Poor quality control and quality assurance are direct consequences of this lack of regulation and oversight. That's why you need to make sure the manufacturer of any products you use follows what is known as pharmaceutical GMP compliance. Supplements that are produced at such facilities follow similar stringent guidelines that pharmaceutical drugs do. It's also critical that you only purchase supplements made from what are called standardized herbal extracts. These are herbal supplements with the highest potency...that is, the active ingredients that are responsible for the herb's medicinal properties. Most supplement manufacturers do not use standardized extracts. Why? Simply because they are much more expensive to produce -- they figure if the customer doesn't know any better, they can make a product for a lot cheaper, and, therefore, have a significantly inflated profit margin. But, you, the customer lose...because without active ingredients, you do not derive any therapeutic benefits. It contains a synergistic blend of standardized herbal extract, along with essential vitamins, minerals and nutrients to help complement a diet to lower cholesterol as well as promote overall wellness. The product is a special cholesterol lowering formula that contains a synergistic balance of herbs, vitamins and minerals to lower cholesterol. We have also found a product that works in conjunction with the cholesterol lowering formula called Total Balance which acts to improve heart health as well as promote general well-being. Some of our editors as well as our visitors have experienced success with the Cholesterol Lowering Formula as well as Total Balance in conjunction with a diet to lower cholesterol to lower cholesterol. As with all health supplements, results vary from person to person so be sure to consult your physician or qualified herbal professional before taking any supplements to lower cholesterol. You should also follow a diet to low cholesterol in conjunction with supplementation.